Warsh, who originally felt more aligned with the Black Mountain poets and the San Francisco poets than with the New York School, later came to realize “that all the geographical/aesthetic divisions which Don Allen used to structure his anthology were open to question...and this insight...had a lot to do with my later stance as an editor.” Angel Hair and its readers benefited greatly from this geographically open stance. Anne Waldman, reflecting on the magazine's brief but influential history, said that “the magazine was a project of friendships, artistic collaboration, which are defining qualities of ‘New York School.’ Yet our project mixed up East and West Coast scenes and juxtaposed them in an unusual and appealing context....In retrospect, Angel Hair seems a seed syllable that unlocked various energetic post-modern and post-New American poetry possibilities, giving a younger generation cognizance that you can take your work, literally, into your own hands.” This DIY spirit infuses the poetry scene to this day, with our current abundance of journals and presses, many of which encourage the mixing and mingling of various scenes and styles of poetry. 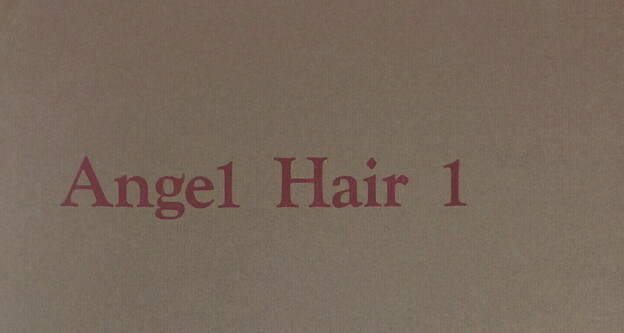 We can look to Angel Hair, along with some of its contemporaries, like 0 to 9 or Ted Berrigan's C, as the crucial precursors of the contemporary experimental poetry scene. After escorting a group of NYU students to the Fales Library in 2014 to see select materials for our class, Small Journal Production, during which students assemble and produce the McGhee Divsion Writing Program's student literary journal, Dovetail, I wanted to explore one part of their archive more fully: the Avant Garde Collection. Started in the mid-1960s by Mel Edelstein, a former director of Fales Library, the collection includes books, chapbooks, journals, and broadsides from poets writing in the 1960s and 7os. There are issues of 0 to 9, Angel Hair, Caterpillar, and Ghost Dance, as well as related papers, artwork, and correspondence. It's a fascinating archive for an editor, poet, or student of literature, so these posts will document and briefly annotate some of its treasures for the Jacket2 audience. Laura Sims is the author of Staying Alive (Ugly Duckling Presse, 2016). Her first book, Practice, Restraint, was the winner of the 2005 Fence Books Alberta Prize, and in 2006 she was awarded a US-Japan Creative Artists Exchange Fellowship. In 2014 she edited Fare Forward: Letters from David Markson, a book of her correspondence with the celebrated experimental novelist. Her poems have recently appeared in Black Clock, Colorado Review, Denver Quarterly, Eleven Eleven and Gulf Coast. Sims has been a featured writer for the Poetry Foundation’s Harriet blog, and a co-editor of Instance Press since 2009. She teaches literature and creative writing at NYU-SPS. Jacket2 Commentaries feature invited posts by poets and scholars who take a close, serial look at poetry scenes, archives, poetic concerns, or theoretical clusters. Commentaries, although curated, are not edited by Jacket2 staff. We welcome your comments. Send queries and notes to Jacket2 editors here.